Will you run Out of Money one day? U h-oh. This couple is most likely going to run out of money in 2047. How do I know? See those blue bars? Those represent the cash flows that these people are going to have over their lifetime. Notice how the blue bars don’t make it all the way until the end of the chart. That means this couple is not going to have enough to last their entire lifetimes if they continue living the way they do now. The cash flow graph is based on a projection of current and future assets, liabilities, income, and expenses. We take the assets that this couple has today (cash, investment portfolio, real estate), deduct any liabilities they might have (mortgage, car loans), and add in the income we expect them to make (salary, social security, pensions), while deducting their expenses (food, utilities, college tuition). The data is then crunched to arrive at a cash flow analysis like the one you see here. The goal is to have the projected net cash flow stay positive over a lifetime, with enough cushion to weather any unexpected events like early retirement, or increased expenses. In this chart, the blue bars disappear too soon. But with some careful financial planning, this couple could make small adjustments in an effort to see their flow turn positive instead. What does your cash flow look like? 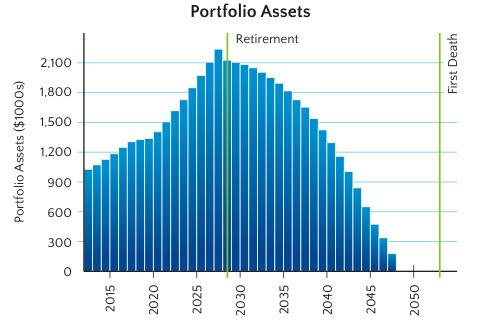 Will you have enough to last you for a lifetime, or will you run out of funds sometime after retirement? Contact me for a complimentary financial plan, and let’s find out! Tax Tips for Small Business Owners Many small businesses oftentimes have sloppier accounting procedures than larger firms. Here are the common traps to avoid . . . The Importance of Yield in Creating a Portfolio Although capital appreciation is a real part of your return, I tend to look at yield as the most healthy part of your return . . . 7 Audit Flags for the IRS High income earners and those claiming business or rental property losses appear more subject to IRS scrutiny . . . Will you run Out of Money one day? Will you have enough to last you for a lifetime, or will you run out of funds sometime after retirement? . . . The “Paris Hilton” Tax What is one of the reasons that the government created an Estate and Inheritance Tax? . . . Maximizing your Retirement Contributions there is a way to contribute more if you have your own small business. This applies even to those who have a one-person LLC . . . What to do with an old 401k? When dealing with an old 401k account, there are usually 3 options. What is the best? . . . Misconceptions about Wills There is a common misconception that if you have a Will created, it is enough to ensure that your assets will pass on smoothly to your heirs . . . TheRight Investment in the Wrong Place Sometimes you can make the right investment in the wrong place. How so? . . . Net Worth — do you know yours? Do you know what you are worth? It might be an eye-opener! . . . IRAs vs Roth IRAs To Roth or not to Roth? That is the question! . . . Can I get a tax deduction for my Home Office? Even if you are eligible to take a tax deduction for your home office, there are times it is not worth doing so. Why? . . . Why can't I just hire aFinancial Planner? How do you know who to hire? When you do hire someone, how do you know that they are doing a good job? What happens if . . . The Value of Value Investing When I used to visit India as a kid, the contrast between it and the US was striking. There were 5 black and white TV channels, women who wore saris . . .
Why Physicians Spend More than they realize? Doctors spend more as they make more. But take away taxes, kids' educations saving, retirement, health issues . . . The INs & OUTs ofMalpractice Insurance 7.4% of physicians annually had a claim, whereas 1.6% made an indemnity payment . . . Physician ContractsProtect Yourself & your Interests When negotiating a contract for your new job as a practicing Physician, there are several important clauses . . . Disability Insurance & Income ProtectionNecessary but often Neglected! Your most important asset is not your home, your car, your jewelry, or other property. It's your ability to earn a living . . . Protecting your Assetsfrom Lawsuits & Creditors Is your wealth vulnerable to potential future creditors and, should the worst happen, could you lose everything? . . .